Heat oven to 350°F. Lightly grease cookie sheets. 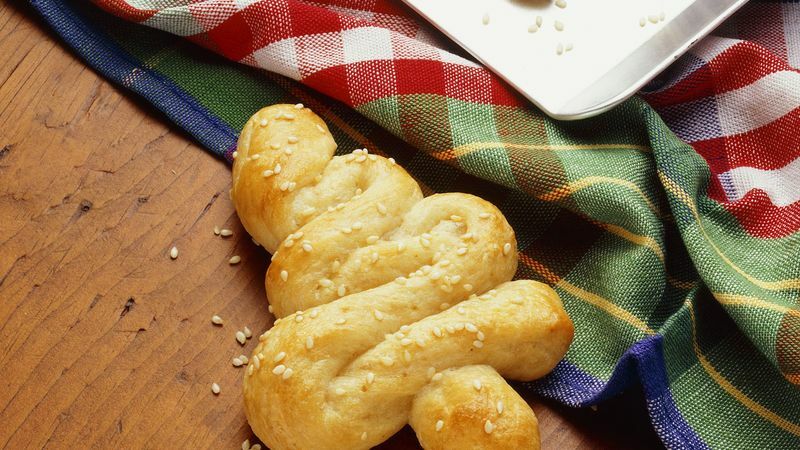 Separate dough into 12 pieces; unroll each into an 18-inch rope. Cut off 1 inch of each breadstick for tree trunk. On greased cookie sheet, shape each breadstick into a tree (see diagram). Place trunk at base of tree. In small bowl, beat egg and water; brush over trees. Sprinkle with sesame seed. Bake at 350°F. for 14 to 16 minutes or until golden brown. Immediately remove from cookie sheets. Serve warm.